YOU GUYS! Who here is super excited to win one of the most anticipated books EVER? Yeah, that’s right — thanks to the generosity of Disney Hyperion, I have a copy of Passenger by Alexandra Bracken to give away. OMG, I could not be more excited for this book and for you to have a chance at winning it. To Enter, just use the rafflecopter! Please note prizing will ship early January following release of the book. While waiting for PASSENGER to hit shelves, be sure to check out the newly released Darkest Minds collection: THROUGH THE DARK. Right now I’m reading WINTER and I’m loving it! I don’t want it to ever end. I can’t wait for Passenger, I’m a huge fan of Alex’s writing. Thanks for the giveaway! Ellie Moreton recently posted..I HAVE AN AGENT! 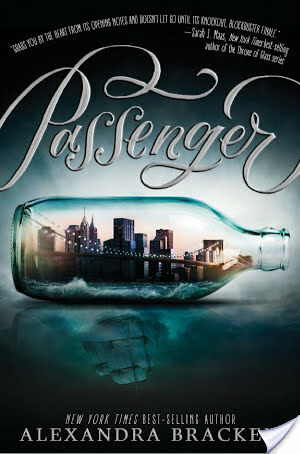 I loved The Darkest Minds trilogy and I can’t wait for Passenger. It sounds amazing! Alex’s writing is fantastic and I’m such a sucker for time travel books anyway. I am currently reading The Shape of the Anatomical Heart! I am enjoying it so far!! Like literally everyone else, I’m reading Winter. I’m also reading Return Once More by Trisha Leigh. Right now I’m reading Demon’s Vengeance by Jocelynn Drake and Sweep In Peace by Ilona Andrews. I’ve been crazily obsessed with this concept ever since I heard! The time-travelling, the romance! I just started Seven Ways We Lie by Riley Redgate, a YA debut, and it’s turning out pretty interesting! Right now I am finishing up the last few books in the Experiment in Terror series by Karina Halle. It’s one of my favorites. I am reading Puddle Jumping by Amber L. Johnson and it has to be the sweetest story I have ever read. And I am also reading Rebel Wing by Tracy Banghart and once I hit the 30% mark I was addicted! I’m reading Without You, There Is No Us by Suki Kim for the Third Tuesday Book Club which is tonight. It’s about teachers sent by a missionary to teach English to North Korean students and the regimented life they agree to. There will be a lot to discuss at the eatery we meet at. I’m currently reading Winter. Followed by a lot of other books from my overwhelming TBR.